It is a known fact that before a heavy exercise, a person must warm up first. This is important to avoid injuries during the workout. One of the most common injuries that can be acquired during the workout or sometimes just by plain moving is sprain. The sprain is caused by a trauma to the joint and the ligaments, more commonly in the ankle, or when you excessively twist your foot while walking, jogging, or running. Sprains are often times extremely painful, and so, it is important to be treated right away. Here are some information on how to provide first aid for sprains. Aside from the usual cry of pain, a sprain may be distinguished by several characteristics in the affected area. Severe sprains cause torn ligaments, which will lead to the swelling of the area. Bruises may also be seen in the area. while the affected joint may also be difficult to move. Warning: Broken bones will also cause swelling, so it is important to be aware on how to properly assess common injuries like these. P-R-I-C-E is the recommended way to treat sprains. P means to protect the area from further injuries. R stands for rest the affected area. As much as possible, do not use the affected joint. In case that you really have to use it, do not make it bear as much weight as possible. I means ice. Use it to alleviate the pain and the swelling. You can use clean ice packs or ice bags on the affected area. C stands for compress the area by using clean bandages. Finally, E means elevate the affected joint to control the flow to the area, limiting the swelling. This can be done by lying down and rest the affected area above the rest of your body. Warning: Do not put the ice for too long, it may damage the tissues of the area. 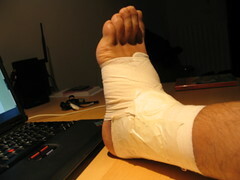 This is only preferable for simple sprains. In case of severe injuries, seek professional medical help. Sprains may be common but no one would want to suffer from this kind of injury. It can be painful and can limit the physical capabilities of the injured. It is therefore important that the injured be treated immediately once he or she had such an accident. Failing to treat the sprain may permanently damage the affected area. Knowing signs of Stroke – Thinks you need to know about giving first aid. First Aid Kit – Steps in making a first aid kit and using it. First Aid for Dog Bites – Applying first aid for sprains and dog bites. Organizing Medicine Cabinet – First aid kit and medicine-related topics. Performing CPR – How to apply first aid for different situations. Sprains and strains are commonly encountered injuries may it be in sports, or just by doing our usual household chores. After we injured it, we want to make the area get treated right away so as not to aggravate it. Knowing the first aid can help reduce the pain and lessen the period to recover it. Try the R-I-C-E method right away. R represents for rest. Resting the area right away can heal it quickly. I stands for Ice. Put ice for 10-15 minutes to stop the swelling. C for compression. Make sure it is not so tight for it not to interrupt the blood circulation. And E is for elevation. Elevate above the heart to helped the swelling down. As a licensed first provider, I always teach my students how long you have to put hot and cold compress on the affected area. It is a very important piece of information because too much heat could scald the the first layer of skin and too much cold could induce the blood vessels to dilate. It is a rule of thumb to apply hot and cold interchangeably for 20 minutes, three times a day for 3 days. By then, you would notice ease of mobilizing it. Give it sometime to recover. It is helpful to splint the body part or have a medical doctor attend to you. I have to disagree with crysh. I am a Physical Therapist and it is not recommended to apply hot and cold therapy interchangeably. You will only damage the tissues when you do that. Aside from that, when you apply heat on a swelling body part, you will increase blood flow which means that you will dilate (expand) the blood vessels, thus amplify the swelling. Another thing that crysh mentioned is that cold could induce the blood vessels to dilate. In fact, cold causes the blood vessels to constrict (shrink). Hot modalities are the ones which dilates the blood vessels. The primary concern is to decrease swelling first. So, the rule of thumb really is to apply cold compress immediately for a maximum of 20 minutes every two hours for the first 48-72 hours. When the swelling has already subsided, that’s the only time you can apply hot compress. Do not apply hot packs or ice directly over the skin. Make sure to wrap one layer of a towel or 2-3 layers of cloth before applying either a hot or a cold compress. The patient should be able to tolerate it. For hot compress, it is best to check for signs of burns every 5 minutes. But be very careful in applying either hot or cold compresses to patients with open wounds and to patients who has problems in blood circulation e.g. diabetic patients. Pain is our body’s defense mechanism. When you felt pain on an injured part, it means that your body is telling you not to move it so as not to aggravate the condition. So, DO NOT move it! If you can, try to immobilize it.